Try your hand at these sculptural puzzles inspired by cosmic phenomena. Astronomers agree on one thing—the universe is an enormous, perplexing puzzle. Short of tackling such galactic mysteries, try your hand at these tactile, brain teasers inspired by cosmic phenomena. 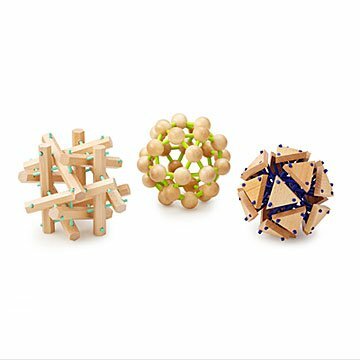 Crafted from locust wood and hand painted, each sculptural puzzle offers an out-of-this-world geometric challenge. When not vexing unsuspecting earthlings, they make space-inspired decor for your desktop or bookshelf. Made in China. Sphere comes already put together. If I would have known that I would have taken it apart before giving it as a gift. Recipient didn't want to take apart. Yeh---A puzzle catering to girls. I would definitely purchase similar items for my students. I purchased this item because our high school has recently turned the area outside of my Counseling office into the Wellness Center where we offer emotional support to our students. Our intent is to make this environment welcoming to our students. My last purchases went a long way.